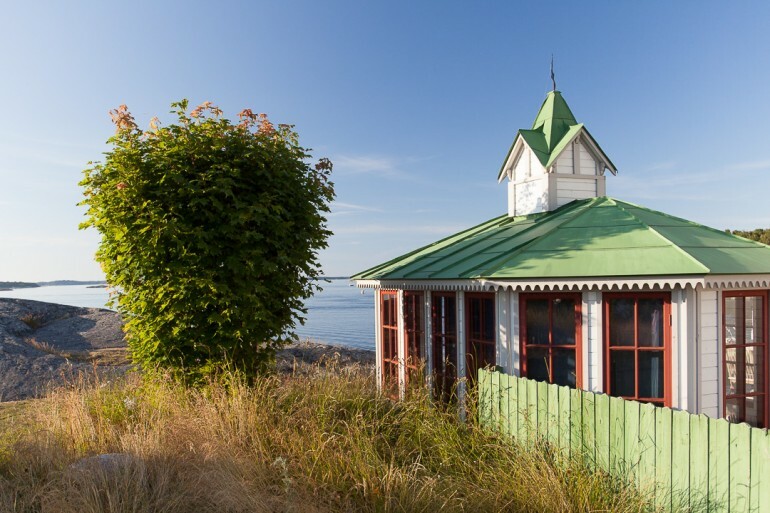 If the archipelago outside Stockholm is a hidden treasure chest, Sandhamn is that one special jewel inside it. Of course, this is an open secret to the people of Stockholm and with one of the biggest marinas of the archipelago it’s a very popular summer destination for the locals. Sandhamn is the main village on the island, Trouville being a smaller one 1.6 km (1 mile) away on the east shore. Technically the island is called Sandön, but everyone refers to it as Sandhamn and it’s located at the eastern outskirts of the archipelago. Due to its strategic location a tolling station was opened on the island in the 1670’s but it was only in the late 1800’s that tourists and summer residents started arriving with the steam ferries. The Royal Swedish Yacht Club (KSSS) built a clubhouse in 1897 (now the building for Sandhamns Seglarhotell) and it became a hot spot for sport yachting and sailing throughout the 20th century. It’s still a central yachting destination with one of the major yearly events being the start and finish of the Round Gotland Race. The island is not big at around 0.27 square kilometers and slightly more than 100 year round residents. The number of residents swell quite dramatically during the summer with 2,000-3,000 more and a marina for 350 boats with more usually anchoring in the waters nearby. The only way to get to Sandhamn is by boat or ferry with all internal combustion engines banned for personal use. This makes the island very calm and serene, especially once the last ferry back to the mainland has left in the evening. Be sure to check the ferry times and be prepared for a bit of a queue during nice summer days. Waxholmsbolaget ferries from central Stockholm as well as Stavsnäs Vinterhamn and Tärnan, the fastest connection, only goes from Vinterhamn. During winter the number of daily departures is severely limited. 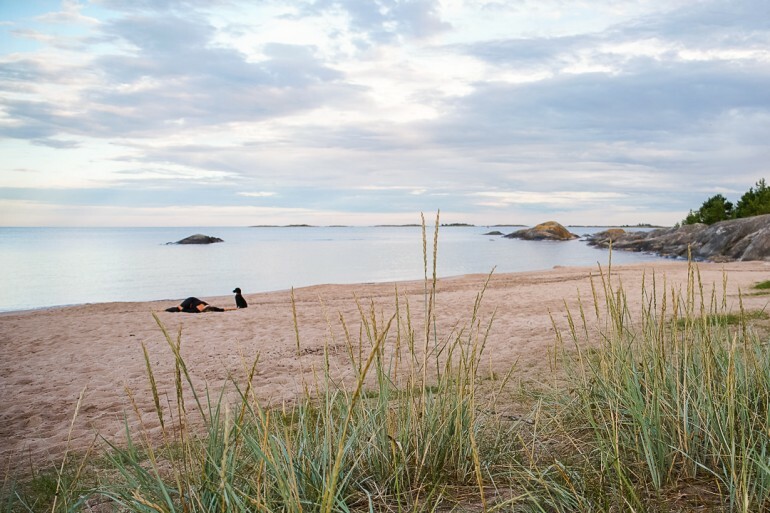 Even in the summer it’s usually faster to take a bus to Stavsnäs and get the boat from there than to hop on in the city, but the trip through the archipelago can be quite nice in itself. For more photos from Sandhamn we have published a little photo essay. Sandhamns Seglarhotell is by far the biggest and most popular hotel on the island, housed in the old KSSS club house it’s a destination in itself. The marina leads right up to main building with more rooms distributed nearby. 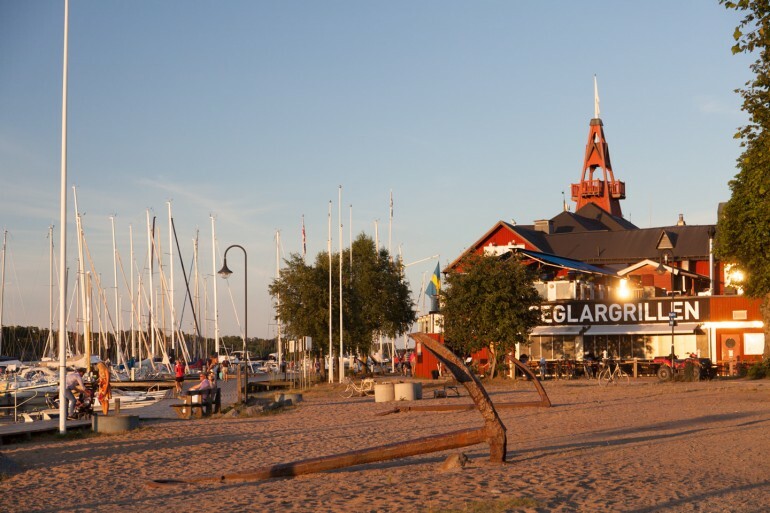 Seglarhotellet is a big local player that also set up concerts and other events during the summer. A little bit away from the marina, up on a hill is Sands hotell, a 15 room hotel housed in one of the bigger, older buildings. Apart from these two hotels the options for staying are basically sleeping in your yacht, bring a tent or find a private residence to rent. There are multiple restaurants inside Seglarhotellet. Seglarrestaurangen provides the most contemporary and upscale food on the island during the evenings and serves a set daily lunch. Terrasen provide really good, simpler diner-style food during the summer season. On the other side of the village bay is Sandhamns Värdshus, is an institution that usually serves husmanskost, traditional Swedish cuisine all year around. 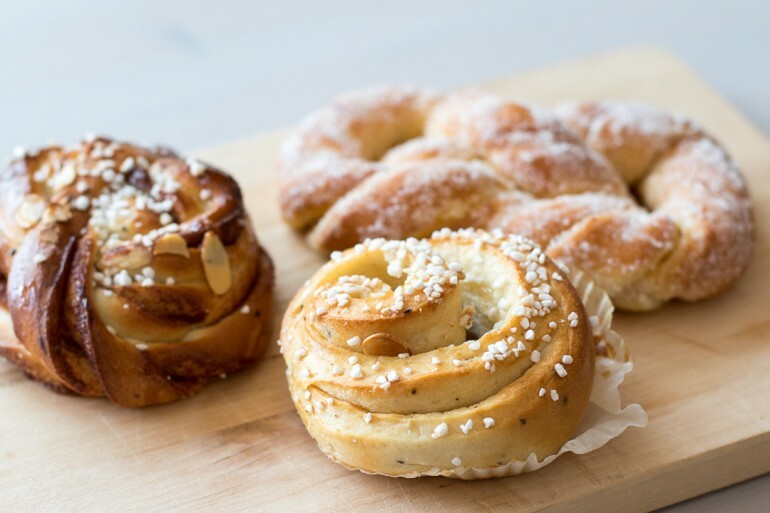 To get some cinnamon rolls for a fika outside, Sandhamnsbageriet has a small range of world class bread, but make sure to get there early to get the best patisseries, especially the cardamom buns, before they get sold out for the day. Monrads provide high-end ingredients and cold food for a simple meal, picnic or for cooking at home. There are a couple more places to explore along with the general store (open year round), but these stand out from the rest. Smörbulle, kanelbulle and sockerkringla from Sandhamnsbageriet. Most of the island is protected forest with lots of paths. Taking a stroll through these and along the shores can be quite calming and really pleasant. With the entire island being around 3 km (1.9 miles) long it’s never far from the village. A nice spot to chill in the village area is Fläskberget overlooking the strait from the mainland. Most day visitors stay in the village or go to the Trouville Beach, one of the better beaches in the entire Stockholm area. 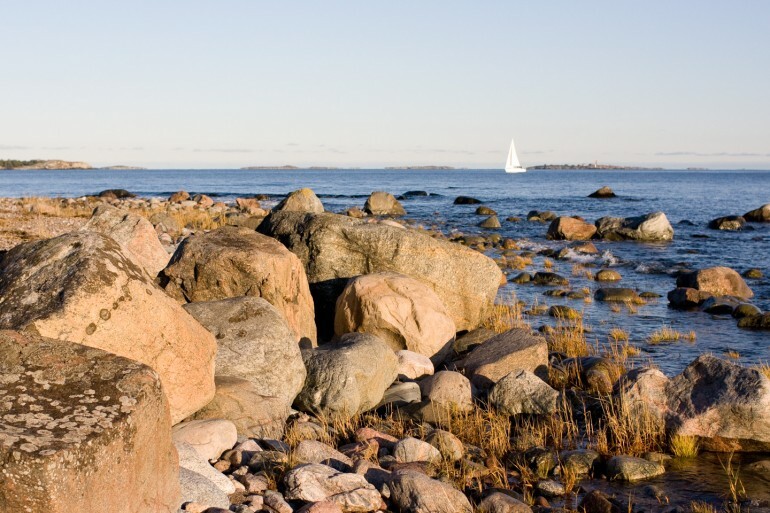 It’s located about a 20 minute walk from Sandhamn village at the end of the gravel road that goes southeast across the island. Turn left when disembarking the ferry and follow it through the village, up by the small slope at the end of the marina and through the forest. The smaller of the beaches at Trouville.